Living in a small community is fun. I spent the first 37 years of my life living anonymously in Glasgow. I could go days without recognising anybody. Hours without speaking to anyone. Now, I’m on Skye and a trip to the local supermarket can take ages. A few minutes to do the shopping and whole lot of time to do some catching up, arranging, organising, planning and gossiping with all our friends, neighbours and fellow parents. Our Co-Op is the social hub of south Skye. I do like the small community atmosphere. It makes me behave myself. I can’t hide in the crowd. I can’t wander the aisles of the Co-Op being miserable, morose, crabby or rude. Someone might tell Mrs L365 or it might reflect on our business. We have made our work very personal by using social media to advertise ourselves and if we piss someone off they can have their revenge on Facebook and Twitter. I do like that if I see something that piques my curiosity, I can ask a few folk In the Co-Op or the people I meet while walking the dogs and have an answer pretty quickly. Nobody can keep something secret for long around here and the curtain twitching nosey genetic heritage inherited from my mother is kept happy. The view from our Co-Op car park. What’s the view like from your supermarket? 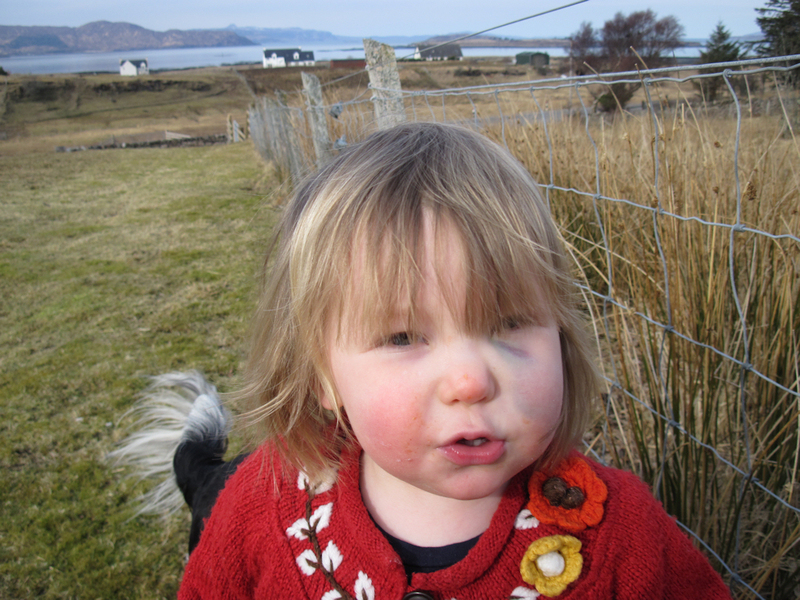 Soon after arriving in Skye our almost 2 year old daughter had a little accident, if getting whacked on the cheek by a swing in a play-park can be called a little accident. A visit to A & E made sure the damage was superficial, and it was indeed declared a little accident. It didn’t look it though. We then settled down to a week of explaining why one of her cheeks was hugely swollen and dramatically bruised. There are few variations on “she got hit in the face by a swing” so it got a bit repetitive very quickly. What we should have done, as a social experiment was to never give the same explanation twice and see which one spread the most, thus finding out who was the best information conduit. We could have also had much more fun with our descriptions. Some examples – Maybe we shouldn’t have let her be an ostrich jockey – now we know why ice hockey net minders have masks – who would have thought standing that close on a golf tee would be so bad – stage diving, dangerous, who knew? – I still say you are never too young to rope a wild horse. More fun but may not have reflected well on us. Another benefit of a small community is that when we have to take our kids to the A & E they are more relaxed because they know most of the staff there. Most of them are neighbours or parents of school friends. Our son was mollified that it was the Dad of a fellow pupil who glued his head back together. There is another side to that – One of the many times I fell while out taking pictures ended up with me having what I thought was a huge gash on my shin. It looked to me like it could be right to the bone. The same dad who had glued our son’s head described it as a “quite nasty scrape”. Now I have to see that doctor every day when we drop off and pick up our daughters from nursery. He stabbed me in the bottom with an enormous needle when giving me a tetanus injection. Something neither of us want to be reminded of. My “nasty scratch.” I still have an impressive scar though. So maybe it’s fine for me to live amongst a bunch of people I know but it must be a little tricky (or interesting) for the folk at the hospital. They have seen a significant proportion of the people they are standing beside in the checkout queue in quite different circumstances. 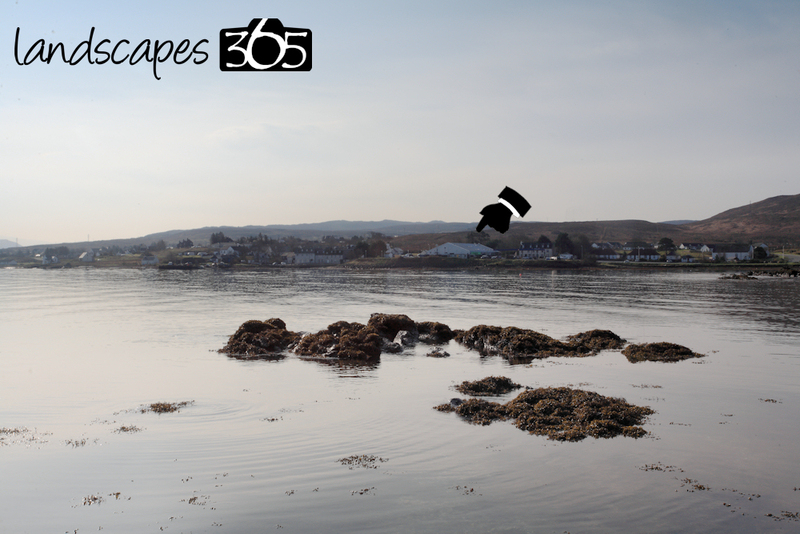 So if you are on holiday in Skye and you come across Mrs L365 or myself don’t be shy about saying hello, we do it every few yards in the Co-Op, outside the school, walking dogs, at the library, post office, chemists, in the play park anyway. Sometimes however we stay in the house just so we don’t have to talk to anybody.